Making a cupcake shaped like a doll’s dress is easier than it looks. First, you’ll need a little kid doll that’s about 4 inches tall. I used a Kelly doll (Barbie’s little sister.) You could make several of these mini doll cakes and make a large Barbie cake as well. Or you could make the cupcake size ones for a princess party and, of course, let the guests keep the dolls. (Remember to give the girls the dolls’ real clothes you’ve set aside as well!) 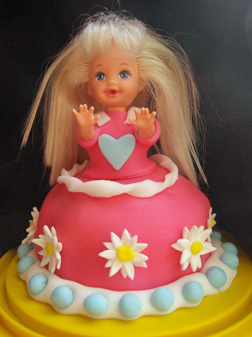 If you choose a doll with her hair up, it might be easier to keep it out of the cake and frosting, but since I used fondant it wasn’t a problem to use this long-haired Kelly doll. You will also need a large, Texas size cupcake tin (not the usual muffin tin size). Of course, if you use smaller dolls you can use regular cupcake pans. Either way, be sure to let the cupcakes cool before decorating them. There are a couple of ways to go about making a doll dress cupcake. You can use fondant (as shown here) or regular icing that is homemade or from a can. (For more about working with fondant, read our cupcakes and fondant page. If you’re using fondant, turn the cooled cupcake upside down on a plate or serving tray. Frost it with a thin “crumb coat” of buttercream or canned frosting. (It may be hard to move the doll once you’ve decorated her, so consider using the surface you plan to present her on.) Roll out purchased fondant (precolored, or tint white fondant with gel dye) on a mat lightly “floured” with a mix of confectioner’s (powdered) sugar and cornstarch. Use a ruler to measure the height of your cupcake times two and add the width of the widest part of the cupcake. Add two inches to this number. That’s how big you’ll need to roll out your fondant. (Probably about nine inches.) Carefully lift up the fondant and drape it, centered, over the upside-down cupcake. Now, carefully go around the cupcake with your hands, pressing the fondant against the cupcake with the palm of your hand. It’s important to push inward, not downward, so the fondant doesn’t stretch and tear. Smooth out any creases. Use a spatula, butter knife or rolling tool to trim excess fondant. Use a spatula or knife to cut a small “x” in the top where you will then insert the doll’s legs. Pose the doll’s arms upward. The dress is easy: Roll out fondant in the same color as the dress bottom and cut a strip that’s as wide as the distance from the top of the cupcake where she’s sticking out to her underarms, which is probably about one inch. Wrap around doll’s torso and trim and secure ends in back. Now cut two quarter-inch strips of fondant in the same or a contrasting color and attach to front and back of bodice for straps. Gum glue (gum paste left to sit in water for an hour) is perfect for securing the fondant, but you can improvise with water or just pinch the layers together. Now you’re ready to decorate the dress! Use small fondant cutters or cookie cutters to make flowers and other decorations. Roll a strip of fondant for the base of the dress. Use your imagination and have fun! To use regular icing to make a doll’s dress cupcake, turn the cupcake upside down and frost it. Stick the doll in. Then, use decorating bag and tips such as star tip to pipe icing onto doll’s torso and to decorate the dress. You can really get creative here!